Residents in Khayelitsha came to the defence of Somali traders on Wednesday when local business owners threatened to burn down the Somali-owned shops. In an attempt to enforce a 2008 agreement between Zanokhanyo Retailers Association and Somalian shopkeepers following that year’s xenophobic attacks that no new Somali-owned shops would open, local business owners in Harare threatened to burn down Somali shops to force their closure. But local residents stood in front of the nine shops under threat, preventing the local business owners from taking action. Residents accused the local business owners of being disrespectful, jealous and racist. “We are tired of these people’s nonsense, we don’t even know who they are and why they’re closing our shops. No explanation was given to us as community members. The Somalis are not leaving,” said a resident who asked not to be named. 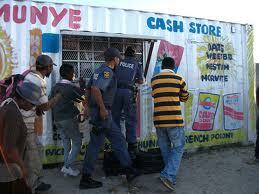 Mambhele Tyathu said residents benefited from the Somali-owned shops. Nosamkelo Nyawuza said she opened a case against the local business owners after they broke a wall on her property where a Somali was running a shop. “I’m a pensioner, the Somalis are renting here. And who’s going to give me that money every month?” she said. Harare residents said they would meet on Saturday to discuss how to prevent local business owners from threatening Somali traders. The local business owners accused their ward councillor Anele Gabuza of turning residents against them. They claim residents are aware of the 2008 agreement. “The community is aware of the agreement. The ward councillor is blocking the agreement. We called him so many times to our meeting but he doesn’t want to attend,” said local business owner Thembile Solani. Gabuza, denied the accusations. He said he was aware of the 2008 agreement but things could change. He said some of the people wanting to burn down Somali-owned shops were not from the Harare area and some of them did not even own a business. He said one of the Somali traders told him the local business owners extorted R300 from him.